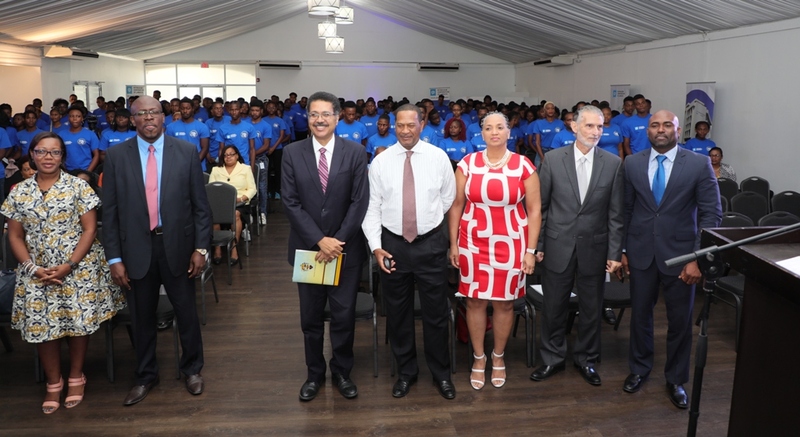 UTech, Jamaica and PCJ Launch Internship Programme for Youth Development — UTech, Ja. The Petroleum Corporation of Jamaica (PCJ) in collaboration with the University of Technology, Jamaica on Thursday, June 14, 2018 launched an Internship Programme for young persons in communities from across Jamaica, at a ceremony held at the Spanish Court Hotel. Posing for a group photograph with the second cohort of participants (from left to right) are Mrs. Karen Elliot, Human Resource and Administration Manager, PCJ, Dr. Andrew Isaacs, Vice-Dean, Faculty of Engineering and Computing, (FENC), UTech, Jamaica, Professor Stephen Vasciannie, CD, President, UTech, Jamaica, Mr. Winston Watson, Group General Manager, PCJ, Professor Nilza Aples, Dean, FENC, UTech, Jamaica, Mr. Russell Hadeed, Chairman, PCJ and Dr. the Hon. Andrew Wheatley, MP, Minister of Science, Energy and Technology. One thousand young persons from across Jamaica aged 18 – 35 years, are benefitting from an academic and life skills-based summer Internship Programme which was launched by the Petroleum Corporation of Jamaica (PCJ) in collaboration with the University of Technology, Jamaica on Thursday, June 14, 2018. Details of the PCJ Internship Programme which commenced in May 2018 and will end on July 20, 2018 were outlined at the launch ceremony held at the Spanish Court Hotel, Kingston. The Internship Programme was developed to provide secondary school graduates and young persons in underserved communities from across Jamaica with a pre-university experience in the fields of technology and business. The one thousand selected participants are being trained over four, three week periods. The group is divided into four cohorts of 250 each and reside at the Halls of Residences at the UTech, Jamaica Papine Campus for the duration of their engagement in the training and development programme. Miss Gean-Ann Senior, Senior Human Resource Officer, PCJ in her overview of the programme, explained that participants were selected based on criteria set by UTech, Jamaica. They will attend classes for a total of 25 hours in subject areas including Mathematics, Language, Information Technology, Energy Conservation, Entrepreneurship and Life Skills. In addition, each participant is given the opportunity to select three preferred emphases of academic focus from the technical areas of Animation, Chemical Engineering, Electro-mechanical, Robotics, Baking Technology, Food Preparation, Basic Construction and Land Surveying. Groups are of approximately 25 persons and sessions are scheduled within the regular university teaching hours from 8:00 am to 9:00 pm. Miss Senior noted that “upon completion of the Internship Programme, participants will be assessed based on their competence level to determine whether they should be recommended for pursuit of entry into UTech, Jamaica’s technical vocational training programmes or for further remedial academic training.” She added that “ultimately our goal is that every young person who participates will be motivated to set new personal development goals and work towards achieving them.” The participants also receive a stipend of $45,000. Pointing out that thousands of young persons across Jamaica have very few options for obtaining any form of tertiary education, Chairman of the PCJ, Mr. Russell Hadeed in his remarks stated that “the PCJ’s Corporate Social Responsibility gives priority to initiatives that allow us to support education and youth development.” He added that “the University of Technology, Jamaica is the right fit as it shares our areas of focus, and in the last 18 months we have joined forces to execute some major youth and education initiatives.” Mr. Hadeed noted that through the Internship Programme in partnership with UTech, Jamaica it is hoped that the lives of young persons will be meaningfully impacted to change their future for the better. Professor Nilza Aples, Dean of the Faculty of Engineering and computing who spoke on the potential of the Internship Programme for academic advancement and social development, said that the partnership with PCJ will provide opportunities for greater synergies with UTech, Jamaica in engineering education, research and innovation in support of the country’s development. Dr. Andrew Isaacs, Vice-Dean, Faculty of Engineering and Computing who has been instrumental in the coordination of the academic training programme, in his remarks said that the PCJ Internship Programme was structured to provide a menu for individuals from diverse academic and social backgrounds to find satisfaction and to prepare them to make informed decisions about their academic future. He noted that the participants are being exposed not just to theoretical concepts, but are being immersed in the related practical environments of the subject areas being taught. Minister of Science, Energy and Technology, Dr. Andrew Wheatley, MP in his keynote address said that “this is a programme of hope and opportunity,” noting that many young persons have the dream of pursuing a tertiary education but lack the means or resources to make it possible. “Today we are making dreams possible,” he said. He implored the young participants present, to cease the opportunities being facilitated through the Internship Programme for education, integration and future employment.